Just over a week ago Joe Cornish and I spent a wonderful couple of hours with Jack Dykinga whilst he was preparing for his keynote speech at Wild Photos, a wildlife and nature conference held at the Royal Geographic Society. While waiting for Jack to get ready, we had the opportunity to see his presentation, albeit at some speed, and got a great appreciation of how varied his photographic output is. 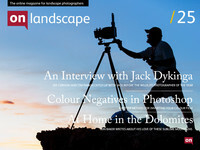 We'll be featuring Jack in a 'Masters of Photography' in the next issue but this issue you can see or hear a range of questions we threw at Jack in our one hour interview. I prepared this video just before a trip to the Lake District and immediately after, Scotland where I'm currently posting this. Unfortunately, the video appears to have rendered as a small screen inside a large black box. I hope this does not reduce the pleasure of viewing too much and I will rectify when back in the office in a couple of weeks time.